I have a sweet tooth that will not quit so I have been trying to get creative with portion size and cut back on the sugar. I have found that I feel more satisfied if I have something on a small plate, and when it looks pretty it just feels so indulgent. This is one of my favorites at the moment. 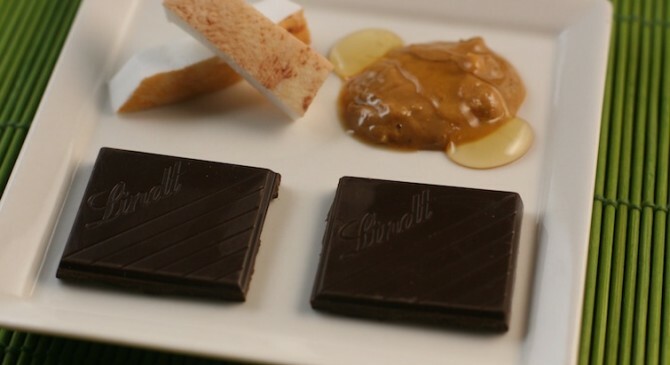 Lindt makes this Dark Chocolate bar with a touch of Fleur de Sel and it is Excellence! The hint of salt makes everything come together just so on your tongue. I love fresh coconut with this chocolate, a far better choice than the Mounds candy bar of my youth. If you like Reese’s Peanut Butter Cups than you will love this with a teaspoon of fresh ground peanut butter and a drop of honey to add another layer of flavor. Try to stay away from the Skippy kind of peanut butter because it is loaded with sugar. The pairings are endless. Fresh raspberries, a drizzle of caramel or a small piece of candied orange peel would be very nice.